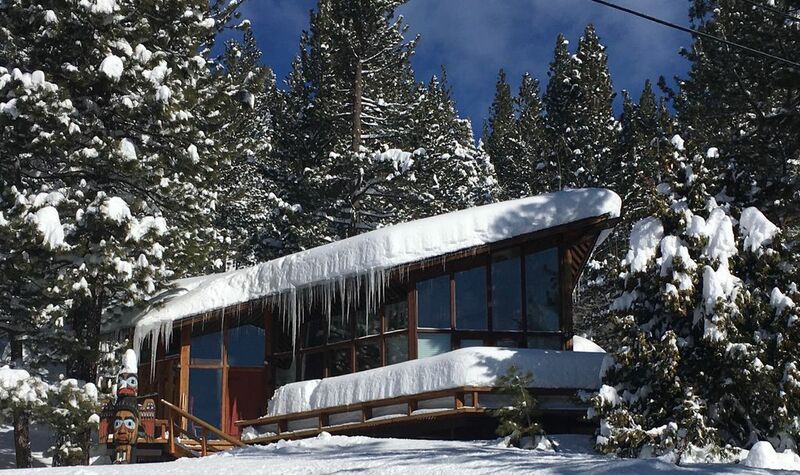 Perfect family ski vacation property! Fully equipped mountain home with breathtaking views of the ski hill. Four bedrooms (one open loft) and two full bathrooms. Sleeps eleven (11) with two private rooms with King beds, one room with 4 bunk beds, and an open loft with a bunk bed and a twin. Even your own private sledding hill just outside your door with all the toys! Just minutes to Squaw Valley Ski Area/Lifts with spectacular mountain views. This wonderful, Norwegian-style, ski 'Hytte,' or cabin, is the perfect place for a family getaway. This is one of Squaw Valley's (Olympic Valley) original homes built for the Olympic Games in 1960. The house has been beautifully updated, with spectacular views of Squaw Valley from the living areas and a huge, wraparound deck. The living area has beautiful, high ceilings and lots of seating all centered around a cozy, rock fireplace. There is also a separate, sound-proof, TV room for those who want some quiet time. The kitchen is well equipped for those groups that would rather dine in. With views of the mountains, the dining room will surely be a great place for some fun and memorable family meals. Great for entertaining! For those of you who want to hit the slopes, you are only a few minutes drive from the ski lifts. In summer you can enjoy the wonderful hikes close to the cabin, take a leisurely ride up the majestic Truckee River bike bath to Lake Tahoe, or wander down to the new Village at Squaw for your morning coffee or to explore all the wonderful new shops. There are also many fine restaurants close in and around the Village. Mountain bikers will enjoy the many trails around Squaw Valley and Lake Tahoe, and golfers have the ultimate challenge with Squaw's Robert Trent Jones-designed 'links' golf course right outside your door! Squaw Valley is located just 45 minutes from Reno International Airport, and a short, six-mile drive or bike ride to the west shore of Lake Tahoe. Three and one-half hour drive from San Francisco. This cabin is one of the original 10 homes built in the Valley by our family for the 1960 Winter Olympic Games. The lot was chosen for its central location and hillside position offering views of the entire valley and ski hill. Snow Removal Service Provided During Winter Storms/Heavy Snowfall. Can accomodate 4 cars. Walking distance to the Village at Squaw Valley at the base of the ski hill and to great restaurants & shops, World-class skiing at Squaw Valley USA minutes away, and 10 minutes from Alpine Meadows Ski Area.